Mirova’s offering is marketed by Natixis Global Asset Management’s global distribution platform and meets the requirements for all types of investors, both professional and non-professional: institutional investors, companies, multi-managers, private banks, independent financial advisors and banking networks. The current imbalance between growth and debt, the decorrelation with the real economy, the depletion of natural resources and climate change issues all highlight that the current economic development model is no longer sustainable. “We are convinced that we need to think about asset management differently in order to better take into account the risks and opportunities of a changing world,” explains Philippe Zaouati, Deputy CEO of Natixis Asset Management, in charge of the Mirova investment division. 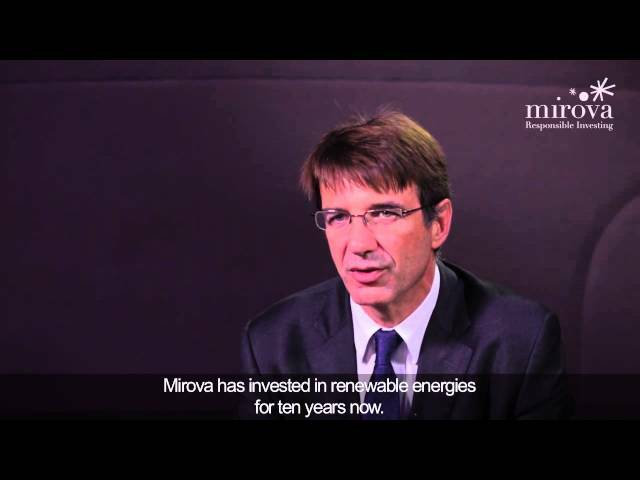 Mirova’s ambition is to play an active and responsible part in financing the real economy and provide solutions to investors seeking returns, sustainability and meaning. • Listed shares management: investing in global companies that provide innovative solutions in 8 major sustainable development themes(1). • Infrastructure financing(2): financing responsible projects with strong yield potential. • Investment with a social and environmental impact, or impact investing: investing in projects and non-listed companies with a strong social and environmental impact. • Voting and engagement: supporting investors and company managers in their decisions as responsible shareholders. Mirova has 36 multi-disciplinary experts driven by a common goal: to offer a new way of looking at investment. These specialists (experts in thematic investment management, engineers, financial and ESG analysts(3), experts in socially-conscious finance and project financing) work together in identifying the levers of sustainable development. In a drive to gain a better understanding of the global changes in technology, politics, regulations, society and markets, the team has also enhanced its approach by forming several partnerships: research partnership with the Cambridge University and joint publications, as well as an active involvement in several international organisations (PRI, ICGN, etc.)(4). “The creation of the Mirova investment division is more than a simple affirmation of Natixis Asset Management’s 25 years of engagement in responsible investment – it reflects our strong ambitions to strengthen our position as an innovative market player and become an international leader in this field,” added Pascal Voisin, Chief Executive Officer of Natixis Asset Management. (1) Sustainable energy, sustainable buildings and cities, sustainable mobility, sustainable consumption, sustainable resources, sustainable healthcare, sustainable IT and communication technologies, sustainable finance. (2) The infrastructure financing business is handled by Natixis Environnement & Infrastructures, a Natixis Asset Management company. (3) ESG: Environmental, Social/Societal, Governance. (4) PRI: Principles for Responsible Investment / ICGN: international organisation dedicated to improving corporate governance standards throughout the world / IIRC: an initiative aiming to design a new type of annual report, incorporating significant information on a company’s strategic outlook, economic environment, financial information, as well as governance, environmental and social/societal criteria. Mirova, the Responsible Investment division of Natixis Asset Management, develops an engaged investment approach aiming to combine value creation with sustainable development. Mirova’s philosophy is based on the conviction that integrating sustainable development themes [in investment approaches] can generate solutions that create value for investors over the long term. Mirova offers a global responsible investment approach based on a single offer revolving around 4 pillars: listed shares, infrastructure(1), impact investing(2), voting and engagement. The second-largest European manager of open-ended SRI funds and social business funds(3), Mirova has €4bn in SRI equity, €7.7bn in advising on ESG(4)/SRI (excluding equities) and €20.4bn in voting and engagement in assets under management (as at 30 September 2012). Mirova has 36 multi-disciplinary experts, specialists in thematic investment management, engineers, financial and ESG analysts, specialists and experts in socially-conscious finance and project financing. Mirova has also formed a research partnership with the Cambridge University for the analysis of sustainable development issues and is actively involved in several international organisations..
Mirova’s offering is marketed by Natixis Global Asset Management’s global distribution platform and meets the requirements for all types of investors, both professional and non-professional. Natixis Asset Management ranks among the leading European asset managers with €286.5 billion in assets under management and 679 employees*. Investment management at Natixis Asset Management revolves around six areas of expertise: Bonds, European equities, Investment and client solutions, Global emerging, Structured products and volatility, developed by Seeyond, and Responsible Investment, developed by Mirova. (1) The infrastructure financing business is handled by Natixis Environnement & Infrastructures, a Natixis Asset Management company. (2) Impact investing: investments with a strong social and environmental impact. (3) Source: Feri Lipper, based on assets under management as at 30 June 2012. (4) ESG: Environmental, Social/Societal, Governance. Natixis Environnement & Infrastructures, a fully-owned subsidiary of Natixis Asset Management since 20 November 2012, is an investment fund management company specialising in project financing for renewable energy infrastructure in Europe and public-private partnerships for a wide variety of projects in France (universities, hospitals, urban transport, etc.). With its four funds, Fideme, Eurofideme 2, Fideppp and Fideppp 2, Natixis Environnement & Infrastructures represents total outstandings of €368 million at 30 September 2012. The UCITS managed by Natixis Environnement & Infrastructure are not subject to authorisation by the French Securities Regulator (Autorité des Marchés Financiers) and may derogate from the investment rules described in the articles of association. Before any investment, it should be ascertained whether the investor is legally authorised to subscribe in a UCITS. Notably, subscription to the UCITS managed by Natixis Environnement & Infrastructures is reserved strictly for well-informed investors meeting the criteria defined in the UCITS articles of association. Natixis Global Asset Management, a fully-owned subsidiary of Natixis, is comprised of management and distribution companies based in Europe, the United States and Asia. The company manages assets of over €570 billion worldwide and has a workforce of almost 3,100*. Listed on the Paris stock exchange, it has a solid financial base with total Core Tier 1 capital of €13.4 billion, a Core Tier 1 ratio of 11.4% and quality long-term ratings (Standard & Poor’s: A / Moody’s: A2 / Fitch Ratings: A+).